Charleswood Roofing offers rooftop snow removal as a winter maintenance package or one time visits. There are many risks related to the accumulation of snow on your roof. Common problems include: ice damming, weight concerns, safety concerns around the building, blockage of roof vents/stacks, damage to roofing material and many more depending on many factors of the building. 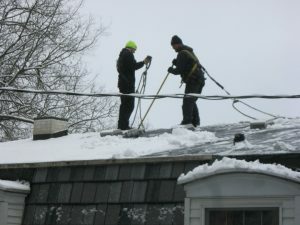 We know how to best approach your snow load or ice problems, while caring for the newly installed roofing materials. Therefore Our Workmanship Warranty mandates that rooftop snow removal must be done by Charleswood Roofing in order for us to honour the Workmanship Warranty for your roof. Submit a estimate request by clicking here, to sign up for our Winter maintenance package or for more information. …Coming Soon: Steam ice dam removal service…. © 2019 Charleswood Roofing | Built & Maintained by Performance ProSites Inc.